Veritas analyst Neeraj Monga says he might initiate legal action against the Indiabulls group for slanderous personal remarks. The background is a report by Canada-based Veritas, the investment and research agency, criticising the policies of Indiabulls, a conglomerate dealing in financial services, among other sectors. The report had also questioned Indiabulls' governance standards. Last week, Indiabulls told the BSE that it had filed evidence with the police of Neeraj Monga demanding money to hold back the report. The latter, in an email interview with Business Standard, said: "The BSE filing accusing me of personally demanding money from them will come back to haunt them in a big way. That is slander and character assassination and a plain lie." 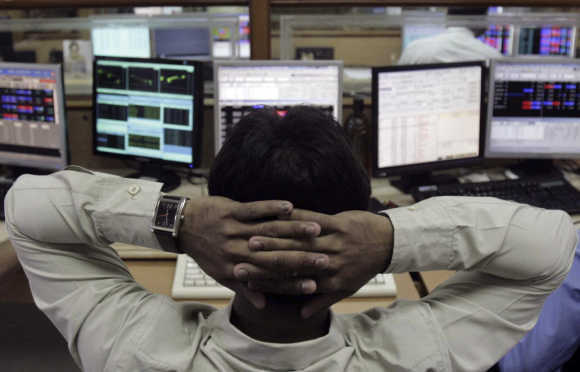 Image: A broker monitors share prices at a brokerage firm in Mumbai. In the email in question, which Indiabulls has filed, there is this extract: from what Monga allegedly had said: "Our first year subscription price is $50K. For the remainder of the current year, we are signing up for $40K. We plan to publish at least two more reports for the rest of the year. We have published on five stocks so far this year. "The report on DLF was published in March and that on RCom in June. Our other report covering an additional three stocks is not public yet. "If you sign today, we can hold the wider release of the third report back by one day for you to read it and take action if you so desire." 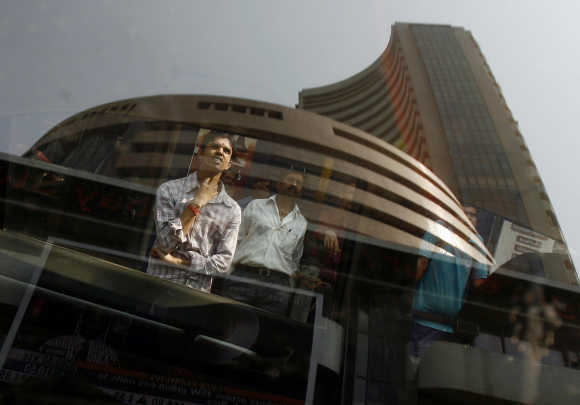 Image: BSE building is reflected on a glass window as people look at a large screen displaying India's benchmark share index in Mumbai. According to Monga the email was sent in the normal course of business in response to a specific enquiry by a London-based fund manager. "No management with a credible character would file a criminal case against the authors of a research report. They are trying to show to the market place, and I paraphrase here, 'The man with the biggest stick gets to take the buffalo home'. "They have forgotten that in global capital markets, the intellectual capital of Veritas and other organisations similar to ours is the opinion maker, and the key deciding factor in allocation of capital," the Toronto-based analyst said. 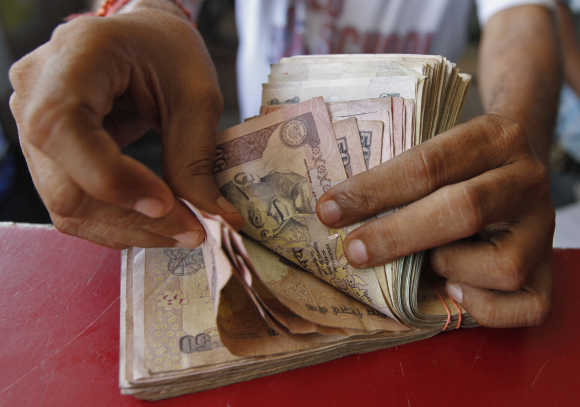 Image: A grocery shop owner counts rupees in Ahmedabad. He added that the aggressive stance that tried to muzzle debate would be detrimental to their cause and by extension the cause of the Indian capital markets. "India can't become a superpower by stifling debate. If a company can't stand up to scrutiny, then it needs new management that can engage and debate." He said international media houses were highlighting "the thuggish stance of Indiabulls and want to talk to me". 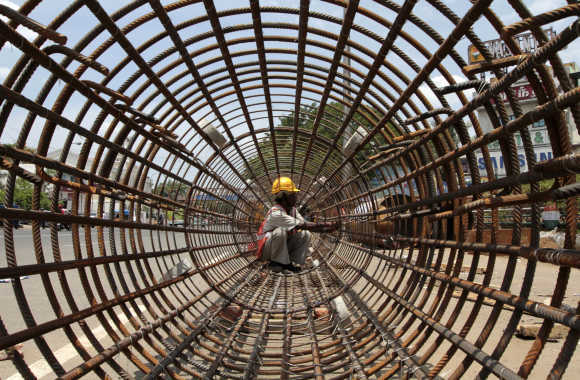 Image: A worker tightens steel rebars at a construction site in Chennai.